There is a certain romance to autumn. Everything is changing around us. The leaves are shifting colours, the air becomes chilly and crisp and our wardrobes fill up with heavy knits and large overcoats. Then there's the food, oh the glorious food. This is a season all about comfort. Large dinners are consumed in front of roaring fires, breakfasts had in flannel pjs and wooly socks and lunches are made for outdoor dining, while the weather is mild and the bugs stay away. 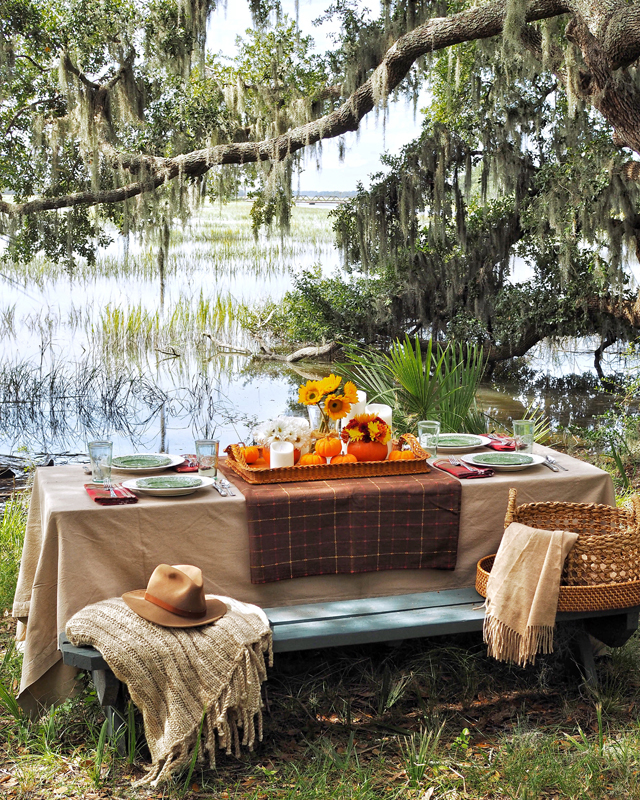 And yes, this little ditty is all about lunch in the autumn air, with a table setting that makes full use of the pumpkin patches popping up everywhere. 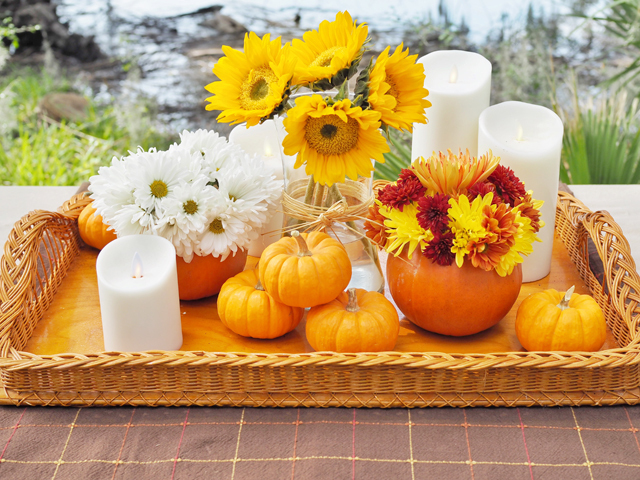 This year, my autumn table is all about the pumpkins and a new trick I'm trying out with using smaller pumpkins as flower vases. This is, truly, no new trick in design as people have been doing it for ages. But, it's a first for me and was so easy I decided to make it a feature for the season. Read that to mean this little flower arranging trick isn't just for my lunch table on this day. This is a regular fixture in my house now through Thanksgiving (although I will be changing out the pumpkins). 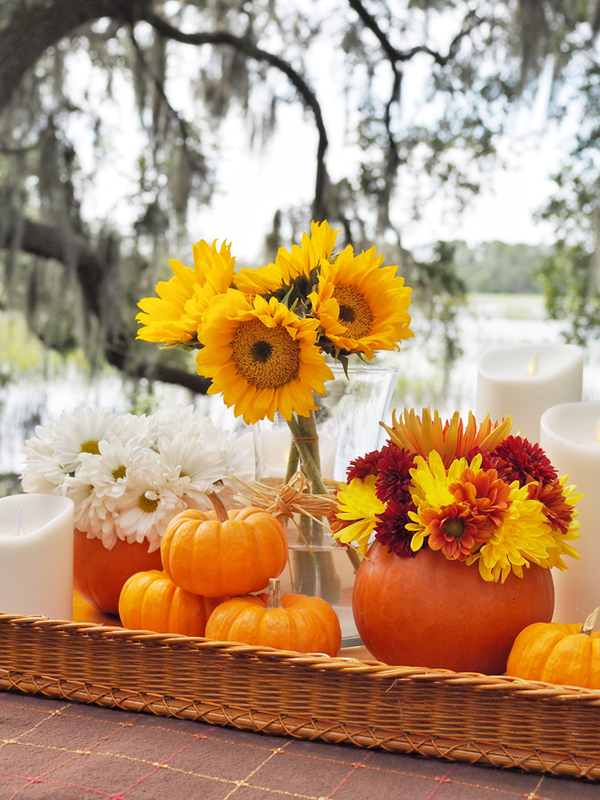 If you've never made a pumpkin vase before, it's as easy as it looks. Simply clean out the pumpkin, just as you would if you were making a jack'o'lantern, only you won't be making any holes for the eyes, nose and mouth. Nope, your pumpkin stays in one, you just want to make sure you have all the seeds and filling out and are left with a clean interior. 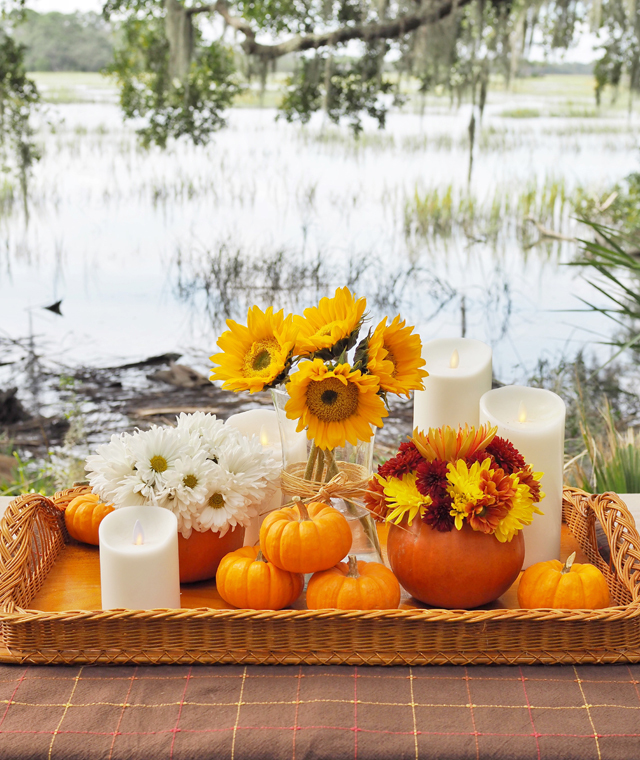 Fill the little pumpkin with water and arrange your flowers, and the table's yours for the taking. If you require a bit more structure with your arranging, put a floral foam block in the base of the pumpkin and pierce it with each flower added! 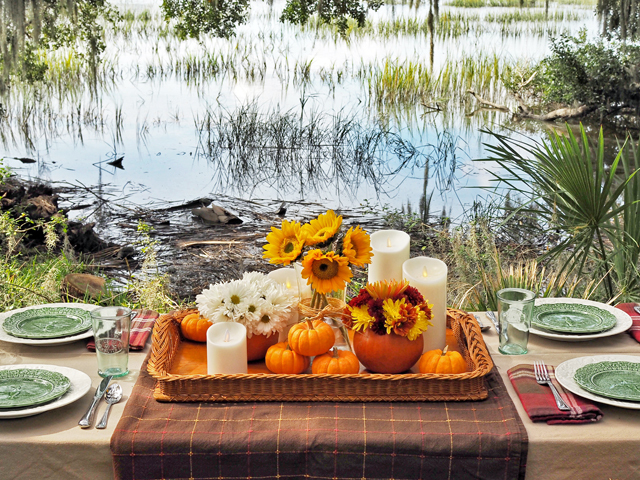 The rest of the table is all about creating a cozy atmosphere that's reflective of the season. There are blankets for laps, if we get a cool breeze. Everything is plaid and neutral to reflect the surrounding colours. 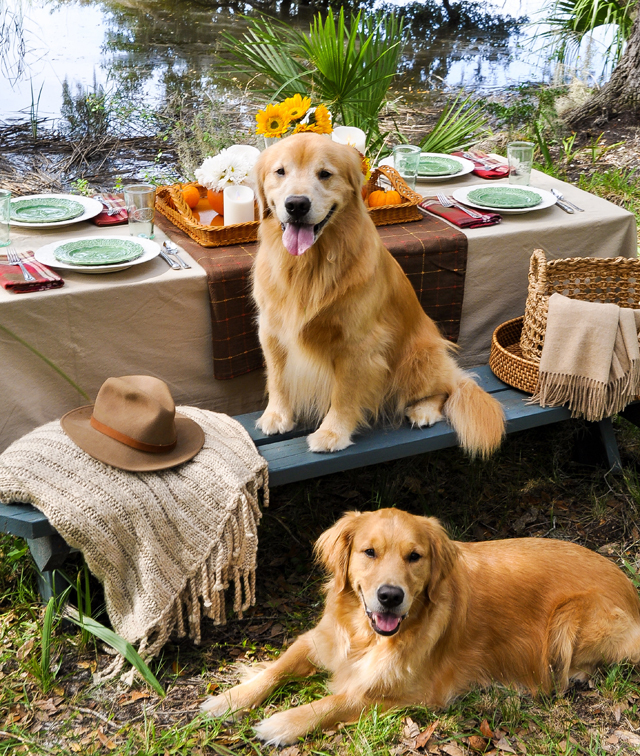 Oh, and there are even golden retrievers, that are there mainly because they insist upon it. But, hey, who doesn't love a golden moment while sipping apple cider and watching the tide roll in? Wishing you all a beautiful autumn ahead and may your season be overflowing with perfectly plump pumpkin moments!